Crooked and gapped teeth can easily make a person feel like they need to hide their smile, plus they can also be much harder to clean, but thanks to the orthodontic options offered by Dr. Gabriel Nossa, you can finally get the straighter smile you deserve. We have treatments that are subtle and predictable, and our team will work with you to find which one is best for your particular case. To learn more about everything we have to offer, contact us today. 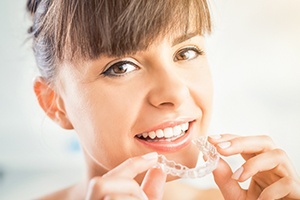 One of the most popular orthodontic treatments available today, Invisalign uses a series of clear plastic aligner trays to gently straighten the teeth in the most discreet and comfortable way possible. They are practically invisible to the naked eye, and when it’s time to brush or eat, you can simply take them out. Now, you don’t have to compromise your daily appearance or habits in order to take care of your teeth.